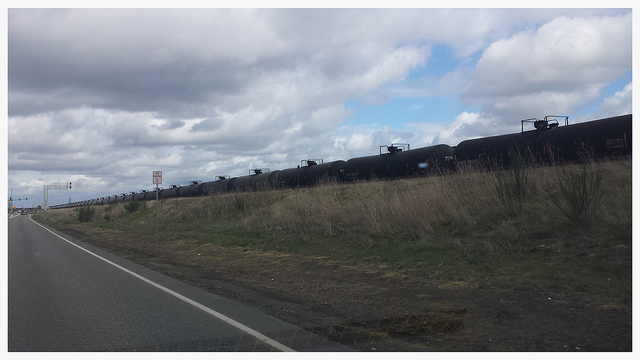 Photo of BNSF oil train by Joshua Putnam, published under Creative Commons license. Last week’s news brought more oil train derailments and explosions. Not here, not yet, but it’s just a matter of time. The Department of Transportation predicted last July that we’ll see an average of 10 derailments a year of crude oil and ethanol-carrying trains, with $4.5 billion in damages over the next two decades — if we’re lucky. If we’re unlucky, one of those derailments could come in a major metropolitan area, with a death toll of up to 200 people and single-incident damages of $6 billion. Concern over oil train safety is driving a series of Twin Cities community meetings on the oil trains running through our community right now. Tonight — Tuesday, March 24 — Representatives Raymond Dehn, Mike Frieberg and Frank Hornstein and Senator Bobby Joe Champion will hold a town meeting at the Theodore Wirth Chalet (1301 Theodore Wirth Parkway) from 6-7:30 p.m. Governor Mark Dayton is pushing for improved rail safety and asking the feds for a full environmental study of a track that could send “high hazard” trains through Minneapolis and the northern suburbs. Besides the danger of explosions in cities, train derailments and spills affect waterways all along their routes. A March 7 derailment in rural Ontario (one of three in a month) spilled oil into local rivers, as well as triggering a warning to local residents to stay indoors to avoid smoke inhalation from the fire. The Washington Post reported that oil train derailments and explosions “shattered all records” last year. CORRECTION: It’s Senator (not Representative) Bobby Joe Champion. Also – great Q&A from city of Crystal here.